Porter McDowell came into the world in 1916 in the small community of Patesville, Kentucky. He passed away in May of 1995 but left a legacy of music for his son David McDowell who carries on the family musical tradition to this day. Porter was raised with three brothers and two sisters and got his education working in the family coal mine. During the Great Depression at the age of fifteen Porter left home by hopping a freight train (which was common practice during the depression) and joined the CCC in Seattle, Washington. This was one of President Roosevelt's New Deal plans to help people help themselves during the harshest of economic times. After the stint in Seattle, Porter set out for the Midwest where he worked his way through Chicago, Illinois and in 1936 ended up in Fort Wayne, Indiana. He called for his family to move up from Kentucky to the what would seem like a prosperous industrial city and they could be together as a family again. Porter had started playing home grown bluegrass music with his family when he was a child in Kentucky. Those were the days of the front porch gatherings which produced some very awesome talent that still influences our music today. Keep in mind there was no television in those days and only the well off could afford a radio, so a community would gather at a neighbor's house and entertain one another. After arriving in Fort Wayne Porter decided to work with a band to make some extra money and that was the start of his musical journey. It appears he first began with Joe Taylor and the Indiana Redbirds. Joe was a popular act in the Fort Wayne are for decades. Porter was the brother-in-law of Slim Adams, and played in a band called the Midwestern Trio for years. By 1949 Porter was working with bands that opened doors and future possibilities for his son, David, as he started his career in music. Porter performed many times on the historical live Chicago radio station WLS, for the National Barn Dance. 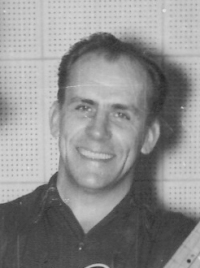 Porter was also a regular every Saturday morning on Fort Wayne, Indiana's WOWO live country music program and also appeared on local radio station WANE. 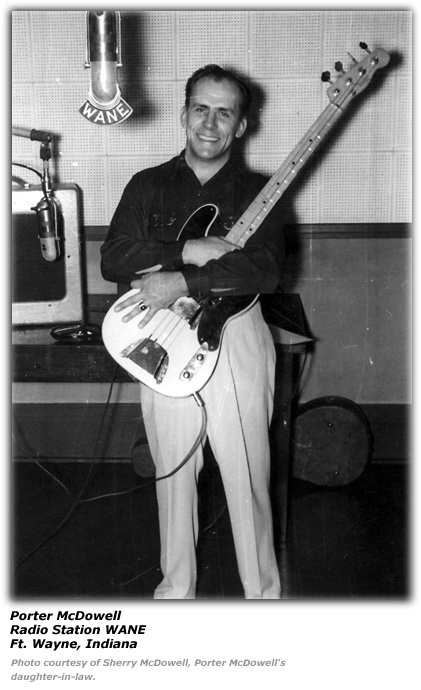 In 1951 Porter who just happened to be in Nashville "in the right place at the right time", was given by Leo Fender of the Fender Corporation, the 3rd Fender Bass off his assembly line for him to try out publicly as a country Bassist. It was a Fender Precision Bass, the 3rd of it's kind. The first being in Leo's possession with the second one still in the factory. Interestingly enough, several years later Porter lost that same bass in a poker game! The lead picture at the top of the bio of him at WANE shows that exact bass Mr. Fender gave him. He played with some of the legendary greats of that bygone era like Roy Rogers, Tex Ritter, Little Jimmy Dickens, Carl Smith, Porter Waggoner, Roy Acuff, and Ferlin Husky to name a few. He played numerous times at the historical Buck Lake Ranch, in Angola, Indiana, known as the Nashville of the North. His daughter-in-law relates that when they would listen to some of the stories that Porter had to share, you could hear history in the making. He used to say "We traveled with a five piece band in a 1941 Packard Hearse with my old stand up bass fiddle stuffed in the back." Porter McDowell is the Grandfather of the Sweet Water Junction Band led by his son David. If you take time to really listen to this excellent family's music, you will hear the product of those seeds that he planted so many years ago. History is still in the process of being made. 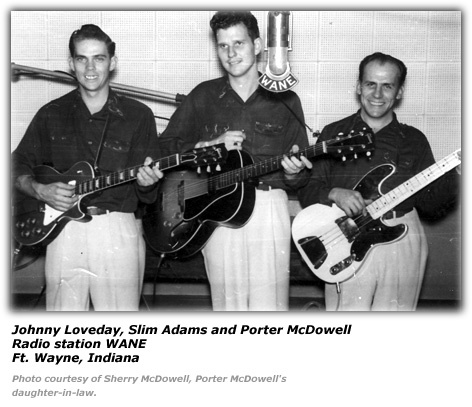 Hillbilly-Music.com wishes to express its appreciation to Sherry McDowell, daughter-in-law of Porter for providing us with pictures and information about Porter's musical career. Hillbilly-Music.com wishes to also express its appreciation to David McDowell, son of Porter for providing us with additional information about Porter's musical career.